The human body performs 5 basic movement patterns of pushing, pulling, bending, rotating, and single leg movements. Everyday activities, sports, and exercises use these movements in a variety of ways, sometimes improperly. Repetitive movements when done incorrectly can result in poor posture, improper body alignment, and potential injury, not to mention a lack of results for specific fitness goals! This is why performing proper movement form and body alignment is so important to learn and execute correctly. Having good form is the best way to get the most of your workouts and your muscles will respond optimally. When the body is aligned properly, its strength and power is optimized in whatever activity you do! Therefore, you will work less to achieve more by increasing your efficiency in motion. When performing an exercise, focus on what muscle or muscle groups you are targeting. This helps to activate the right muscles to achieve your exercise goal. If you do not feel the area you are targeting, then your form could be off. Try adjusting your alignment, reducing the resistance, or changing the angle in which you are moving to accommodate proper execution. Never compare yourself to the person next to you. Everyone excels at a different pace and has different goals. Instead, compare yourself to yourself! What have you achieved from last month or last week? When a strength exercise is performed too quickly, an initial generation of force is produced, which limits further muscle recruitment and relies on momentum. Moving at a slow, steady, and controlled pace ensures your muscles produce force throughout the whole motion rather than using the momentum. Therefore, if the exercise is performed slowly with control, more muscle fibers are recruited and greater benefits of the muscle action will result. If the goal of the exercise is increasing speed, learn the exercise motion with control first before adding a faster pace. Practice performing an exercise by using your own bodyweight before adding additional resistance. This not only ensures correct form but it also allows the muscles worked to stabilize and learn the proper movement sequence without having to worry about external elements. Even when we think we are performing an exercise correctly, there is still room for improvements! Have a qualified fitness professional watch you perform certain exercises to make sure you are doing them correctly. They will often notice things that can help improve your range of motion and form. Small ‘tweaks’ can make all the difference. Listed below are a few examples of common mistakes that are made when performing upper body movements. Whether these exercises are performed on the Total Gym, the floor, or other apparatuses, keeping good form is always paramount. Improper body alignment occurring in the torso can put strain on the lower back by sinking or arching the spine. When spinal alignment is incorrect, the whole body begins to compensate to hold the position. As a result, the shoulders shrug, hand and arm placement shifts, and knees buckle, all of which creates muscle strain and makes the exercise harder to perform correctly. Sinking in the lower back creates an arch in the spine. It compresses the vertebra, which could lead to a spinal injury over time. Piking the hips occurs to alleviate those muscles under tension and compensate for weakness. It reduces the core activation due to fatigue or weakness in either the abdominals or the upper body strength. The anchor points of the hands and feet are what stabilize the body to hold the plank position while placing the emphasis of work on the core. Therefore, the entire body needs to be set up correctly so that the weight is evenly distributed between the upper and lower body to stabilize while the core remains active to protect the spine throughout the movement. There are many exercises that can be performed from the plank set up. Therefore, it is important to have proper form initially when setting up the exercise. When assuming a full plank position, the body will achieve one straight line from the head to the heels for proper alignment. Upper Body: Place the hands shoulder distance apart on the floor with fingers pointing straight ahead. Extend the arms straight with shoulders stacked on top of the wrists. The head, neck and shoulders are an extension of the spine and the nose is in line with the fingertips. Torso: Engage the core by drawing the belly button inward and aligning the ribs in the same line as the hips. You may have to perform a slight tuck in the pelvis to avoid ‘sinking’ of the spine, but not too much that it allows the hips to “pike”. Keep the shoulders retracted and active to hold the upper body in place. Lower Body: Extend the legs long by placing the weight on the balls of the toes. Slightly contract the thighs to lengthen the hamstrings. Think about pressing the backs of the knees to the ceiling to lengthen the thighs. Keep all 10 toes pressing into the floor evenly and keep the ankles active. Slightly press into the toes to shift the body weight forward to keep the nose in line with the fingertips. The wider the leg stance, the easier it is to stabilize. The more parallel the leg stance, the harder the core and strength challenge. Modified: Bend your knees on the floor to reduce upper body intensity while maintaining proper form if/when the standard plank position becomes too intense. This will allow you to focus on the alignment of the spine and core activation. The spinal alignment is straight from the crown of the head to the knees. This improper technique occurs when the spine is misaligned or the resistance load may be too heavy. The upper body begins to round forward creating tension in the neck and shoulder region. This also creates tension in the lower spine and makes performing the exercise dangerous due to an unsupported core. If the postural alignment is slouched or rounded, it throws the entire spine into misalignment before the exercise is even performed. Sit or kneel on the glide board with the chest lifted, shoulders back and down, and the spine extended long. Grab the cables and extend the arms straight to begin. Keeping the extended posture of the spine, use a controlled movement to bring the hands toward the underarms by bending at the elbows in a wide position. 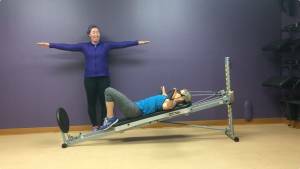 As the rowing motion is achieved, activate the upper and middle back muscles and focus on preventing the shoulders from rounding/ slouching forward or rising toward the ears. Repeat this motion with control and proper spinal alignment at all times. Often exercises are performed using a swinging motion to make heavy weights easier to lift. Using momentum to make an exercise easier not only cheats you from doing the exercise right, but it can also cause injury. Swinging weights to gain more leverage to lift them actually creates too much range of motion putting unnecessary strain on your joints and ligaments. Instead, the exercise should focus on a more deliberate range of motion where the muscles can remain contracted through a safe range of movement to avoid hyperextension. Exercises have varying levels of resistance throughout each motion. For example, more force is required to lift a load when the distance between the load and the counteracting force is large. Alternatively, a smaller force would only be needed to overcome the same load when the weight is kept close to the force being applied. This concept is important to understand when choosing the appropriate resistance needed to carry out the exercise. Bicep Curls on the Total Gym: Choose an incline level that accommodates your fitness strength. This is important to challenge the muscle appropriately and helps to avoid ‘swinging’ through the motion. Assume a seated or kneeling position facing the tower and grab the cables into each hand. Sit up with the spine extended straight, chest lifted, and shoulders retracted. Begin to curl the arms by bending the elbows and bring the hands towards the biceps. As you extend the arms, use control to lower them down by avoiding a sudden ‘drop’ in the motion. This drop occurs when the muscle is not activated or contracted through all points of the motion. Therefore, keep the contraction and control consistent at all times. 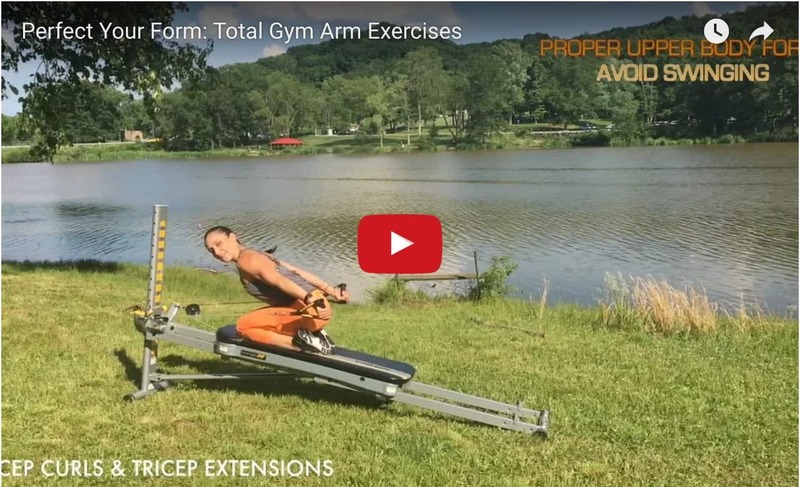 Tricep Extensions on the Total Gym: Choose an incline level that accommodates your fitness strength. This will allow the muscles to be challenged appropriately and reduce the swinging motion. Assume a seated or kneeling position facing the tower and grab the cables into each hand. Lean forward slightly from the hips to create an angle of the spine and engage the core to stabilize the movement. Keep the arms parallel to the body as they extend fully behind the hips. Return to the start position by bending the elbows to a 90’ position while keeping the muscle tension constant. Avoid performing too large of a range of motion to prevent ‘swinging’. Repeat for the desired reps.
*Be sure to check out the video to see how these exercises are performed using proper core form. Muscles have memory and if you have been performing a movement the same way for years incorrectly, chances are your body only knows that way. If your form is “off”, be open to changing the way you move. You will be amazed at how well your body corrects imbalances and how your muscles respond to correct movement patterns. There’s no doubt that using proper form during your workouts will prevent injury and will help you achieve the results you want. Take the time to perfect your form even with exercises you have been doing for years! Hey, great post with all those pointing out mistakes and tips. I’m sure it will really help to improve for a great deal of people!